"We've done more than our share to see you right, but you're a Hershey, a true son of a dreamer," Milton's Uncle Abraham said. "You'll never stick with anything long enough to make it work for you." Milton gulped. He'd already suspected that his relatives had given up on him succeeding as a candy maker, but the words still stung. When Milton Hershey's famous Hershey Bars debuted in 1905, few people knew of the hard work, dedication, and sacrifice preceding the triumph. Debt, lack of support, and fatigue had been constant companions for the famous chocolatier and philanthropist - a man with a fourth-grade education. Despite comparisons to his wandering father, Milton never gave up. Learning from his mistakes, he spent a lifetime creating sweet things to eat - first caramel, then chocolate. 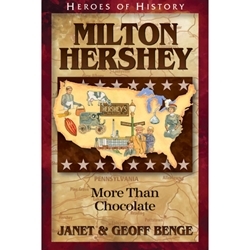 As his company soared, Milton used his wealth to care for others, founding a town for Hershey workers, a school for children in need, and a foundation dedicated to education, culture, and health care (1857-1945).